…but common sense and ill health haven’t stopped me yet. So I raced. As best I could and to be frank I didn’t think I did that badly. My lap times were nice and consistant throughout the race (the actual riding time – not the overal time including faff stops), my legs didn’t get tired and, as is always the case at ther Strathpuffer, the camaraderie out on the course meant that heading back out from the pits was never too miserable a task. OK so I lacked any top end power and any real attempt to ‘put the hammer down’ just resulted in a horrible burning sensation in my lungs and the appearance of lots of snot (check the pics as they start to filter through – I look like I’ve been attacked by The Blob), but I got round. OK so Angela couldn’t help me with the more mechanical side of things back at the JMC.it MeGazebo, so I spent a fair bit of time (several hours, in fact, if the incredibly detailed records Angela kept are anything to go by) faffing with brakes/tyres/wheels etc, but she cleaned and lubed the bikes lap after lap, had food and drink ready every time I needed or just wanted it and forced me back out riding when it looked like I was lingering too long*. I had little to lament, basically. I turned up feeling grotty, but thanks to great kit and great support from all around I made a bit of a race of it. 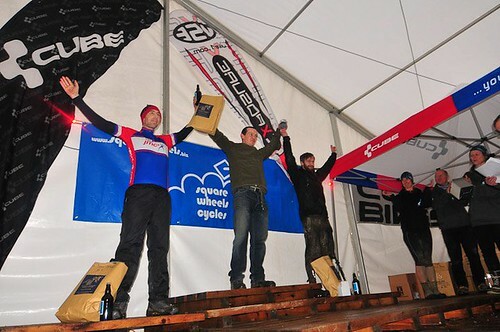 I didn’t win, but I enjoyed it (as much as you can enjoy a tough 24hr race…), had a laugh and got back on the podium. That’s more than I could have hoped for. *In fact Angela did this for 3 of us, while suffering with a cold and having two of her fingers taped up after slicing them open on the Friday night. Tough stuff! Right, yes, erm, my lungs hurt, all over. My nose quietly runs, before freaking out and kicking off a fit of sneezing. Then the sore lungs demand a period of coughing up lung butter. I tried riding on Sunday in the hope that a bit of a fresh air blast would help clear everything up, but sadly it’s just made everything much worse (it was also the first ride in a long, long time where I was looking for a bench to sit down on and have a doze…after 3hrs). So I’ve now taken up residence on the sofa while dosing myself up on vitamin C and such healthy things, wondering if I can get rid of whatever is causing this lurgy by Friday, in time for the trip up to Scotland for the Strathpuffer. Bummed out for him missing the race, but glad he’ll be back in a few weeks to get riding in preperation for the National Champs in May. Sunday’s race went badly. Really badly. Not “injury” badly, but pretty badly nontheless. The ride over there was done faster than I wanted due to setting off a bit late (my fault obviously) abnd getting a puncture (not my fault), but that was nothing compared to the race itself. I set off, sprinted backwards through the field, crashed within the first minute on a completely straight, flat bit of field…and that pretty much summed the whole thing up! 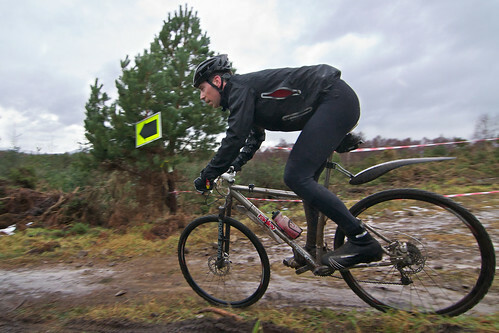 Thick, claggy mud had me off the bike every lap or so to clear the wheels which had jammed completely. Course marking tape got knotted in my cassette and took an age to dig out. Any skill I possess was stood on the sidelines heckling me as I failed to get round any sort of obstical and my legs refused to crank up the pace at any point. You don’t have to take my word for it either, watch this helmet-cam clip of the first lap; I’m the lame looking bloke in the JMC IT (blue white and red) top & black helly hansen base layer just in front. I still sort of enjoyed it though. Sort of! The ride back was nice enough, no mishaps save my rear light bouncing free of the bike every now and again and trying to make a break for freedom down the road and no tiredness either, which is good, considering the Strathpuffer is now really looming! Speaking of while, I’ll do a WeatherWatch for it soon…not yet though as all the outlooks are still scarily snowy!